Recently I wrote a letter to the editor in response to an editorial in Home Media Magazine. To my delight they decided to publish it, so click through to the digital edition. Sure Obama might make Iraq and the economy worse — assuming it’s even possible — but there are plenty of reasons why a geek should be optimistic about his presidency. Joe Biden won’t be able to vote for the DMCA again — unless there’s a tie in the Senate. There could be presidential addresses via Twitter. We may not ever have to fill out another form at a doctor’s office. He wants a playoff system in College Football, like any football geek would. Our pipes should stay free thanks to his support for Net Neutrality. Our kids might be saved thanks to Stem Cell research. The broadband speeds should increase thanks to his communications infrastructure plans. His plan to reform the patent system could lead to more innovation. He may save our life — or the life of a loved one — by modernizing the Public Safety Network. He’s sure to use the web to run the country, the way he did for his campaign. So if my new president will stick to this and at the same time leave my guns alone, leave my money in my pocket — yeah I know, fat chance — then we’ll get along just fine. Why Netflix is such a great deal for the movie watcher. On a recent podcast, a guest made a very interesting point. Jon said that Vudu is a better deal for him because some months he doesn’t have time to watch movies. So in other words, the pay as you go plan works best for him. I started to wonder about my own usage, as I’ve been known to go a month without watching a movie. So I decided to take a look at my usage history on the Netflix’s site. To my surprise I’d watched 76 movies in the past 12 month. Now don’t ask me where I found the time to watch that many movies in 12 months, because I just don’t know. It feels like I watch one a month, but the numbers don’t lie and although I rent the occasional movie for my wife and daughter, not very many. But just to put it into perspective, that is over 6 movies a month or 1.5 movies a week. Now the reason I say that Netflix is such a great deal for me is because even with the new $1 Blu-ray tax, I’m still only spending $252 a year. If I was using Vudu or Apple TV, I’d be spending almost twice that at $455 a year. But if I really want to get into rip-offs, then I’ll look at my FiOS TV bill. Sure it offers some great quality and at about 100 HD channels, a great selection of HD, but my bill is about $800 a year. So if I don’t count all the time I spend watching OTA HD programming for free, the amount of time I actually spend watching FiOS TV is way less than the 3 hours a week I spend watching Netflix Movies. So yeah, I’m wasting my money. 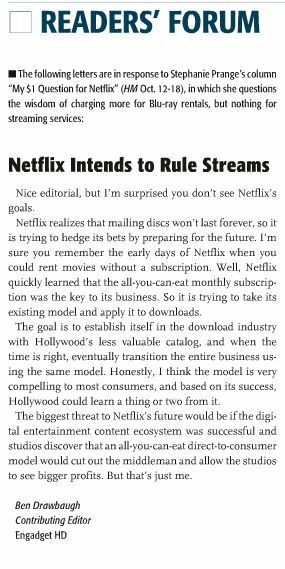 The bottom line is as soon as football season is over — gotta have ESPN and the NFL Network for the games after all — I’m dropping FiOS TV, but not to do the trendy downloads thing, I’m going strickly OTA HD and Blu-ray via Netflix.